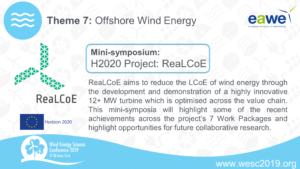 We are happy to inform you that during the Wind Energy Science Conference in Cork, Ireland, the ReaLCoE project will be hosting a seminar and social event to which you are kindly invited. ReaLCoE aims to reduce the LCoE of wind energy through the development and demonstration of a highly innovative 12+MW turbine which is optimised across the value chain. This mini-symposium will highlight some of the recent achievements across the project’s 7 Work Packages and highlight opportunities for future collaborative research. To register for the seminar and social event please click here.